I try to keep homemade bread on hand in our freezer. There's nothing like it for morning toast, a tasty egg salad sandwich or a nice grilled cheese. This time I used a basic sandwich bread recipe from the folks at King Arthur Flour and decided to double it - one half for a loaf and one half for some rolls. 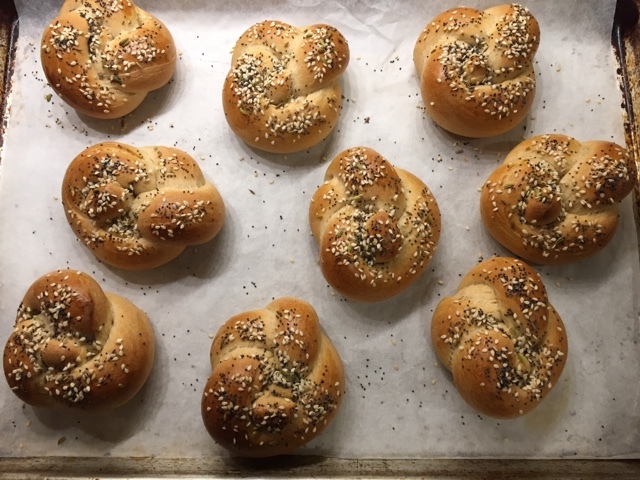 The recipe uses a basic straight dough made with all purpose flour, although there's a suggested option for replacing half of that with white whole wheat flour (which is what I did). Here's the base recipe (remember - you can double it as I did). Combine all the ingredients in the bowl of a stand mixer fitted with the dough hook. Mix on low to moisten all the ingredients until the dough starts to pull together. Then knead on low for about 5-6 minutes to achieve a smooth and supple dough. Place the dough into a lightly oiled bowl, cover it and let rise for about an hour at room temperature. Place the dough on a lightly oiled surface. In my case I divided my double batch of dough in half and shaped one half into an 8 inch log which I then placed in a lightly oiled 8 1/2" x 4 1/2" loaf pan. Cover with lightly oiled plastic wrap and allow it to rise about 60 minutes (or longer if you're working in a cool kitchen). The dough should crown about 1 inch above the pan rim. 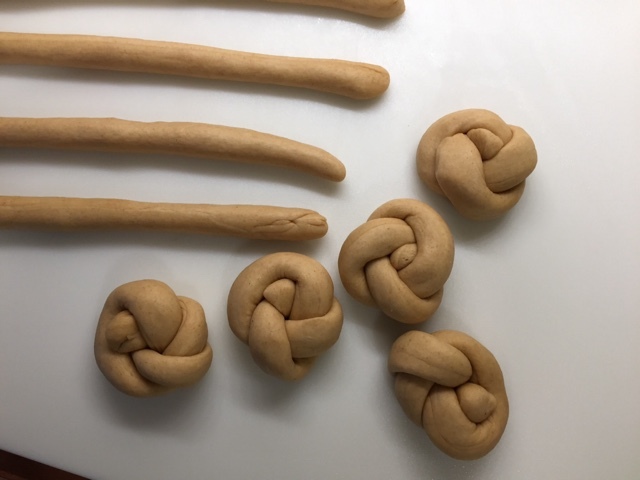 The second half of dough was destined to become knot rolls. Oh boy! Working on a lightly oiled surface, I divided the dough into nine 85 g/3 oz pieces. I rolled each piece into a snake-like ~12" length and formed each into a knot. Cool! It's all about tucking the ends just so. 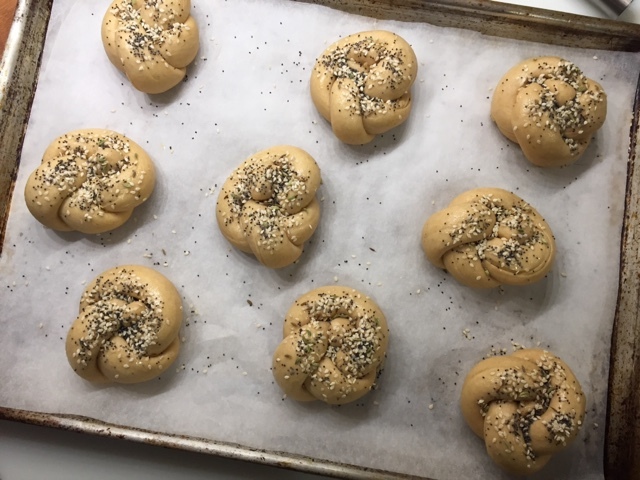 I placed the rolls on a parchment paper lined sheet pan, covered them loosely with lightly oiled plastic wrap and gave them a good 1 to 1.5 hour rise. I heated the oven to 350ºF. 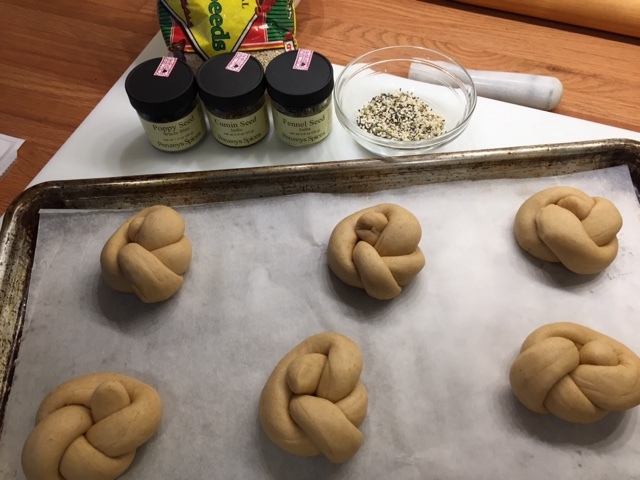 I made a mix of fennel, cumin, sesame and poppy seeds . . . .
then lightly brushed the knots with egg wash and sprinkled them with the seed mixture. After about 20 minutes of baking time, they emerged nicely browned and smelling heavenly. They had a bit of cooling time before we took some over to Mom's for supper. 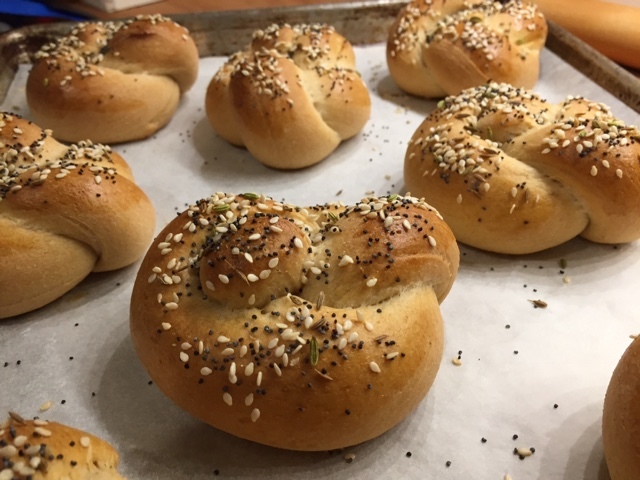 There's nothing like a freshly baked warm roll with a bit of thinly spread butter. You can't beat it.